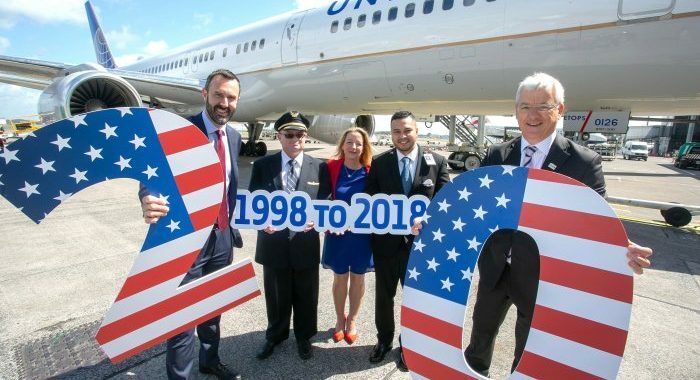 SHANNON, June 14, 2018 – United Airlines is marking 20 years of its nonstop service between Shannon and New York/Newark. Since its launch in June 1998, the service has carried over 1.9 million customers on more than 13,500 flights. Operating on a seasonal basis (during 2018 from 10th March to 27th October), United flight UA24 departs from Shannon daily at 12:30 p.m., arriving at New York/Newark at 2:45 p.m. the same day. The return flight departs from New York/Newark at 9:55 p.m., arriving in Shannon at 9:15 a.m. the next day. Shannon-New York/Newark flights are operated by Boeing 757-200 aircraft with a total of 169 seats – 16 flat-bed seats in United Polaris business class, 45 in United Economy Plus, and 108 in United Economy. United Polaris business class, United’s new business cabin, features a reimagined, sleep-enhancing experience for intercontinental travellers. The first phase of United Polaris is now available on board and features an elevated inflight food and beverage experience, custom bedding from Saks Fifth Avenue and exclusive amenity kits with products from Soho House & Co’s Cowshed Spa. United Airlines has been serving Ireland for 20 years. In addition to the seasonal service from Shannon to New York/Newark, United today offers its customers from Ireland year-round nonstop flights from Dublin to New York/Newark and on a seasonal basis from Dublin to Washington/Dulles and Chicago. All flights are conveniently timed to connect at United’s U.S hubs with an extensive network of services to destinations throughout the Americas. Customers can book by visiting united.com or calling 1890-925-252, or their travel agent. United operates the largest hub in the New York City metropolitan area at Newark Liberty International Airport. Located just 14 miles from downtown Manhattan, the airport offers the fastest surface transfer journeys to many parts of the city, including the AirTrain service to New York Penn Station in midtown Manhattan, with a journey time of less than 30 minutes. From New York/Newark, United operates flights to more than 280 destinations in North, Central and South America and the Caribbean, including more than 100 served nonstop.